Located at the confluence of the Rock River and Turtle Creek, what is now Beloit was long home to various tribes of Native-Americans, from the ancient Mound Builders to the Winnebagos, the last to have a semi-permanent settlement at the future Beloit. This last tribe abandoned their settlement in 1832 when Black Hawk and his followers were pursued through the area during the Black Hawk War. Joseph Thibeau was the first white man in Beloit following the departure of the Winnebagos. A French fur trader who had a good reputation with the Indians, Thibeau settled at the southwestern corner of present day State St. and Shirland Ave. It was he who greeted Caleb Blodgett, Beloit’s first permanent settler. Thibeau sold to Caleb “three looks” of land, and this purchase marks Beloit’s beginning as a village. With the arrival of the New England Immigrating Company in 1836, the future of the fledgling community was assured. This group came from Colebrook, New Hampshire, and was led by the able scout Dr. Horace White. They bought land from Caleb Blodgett, started developing it, and soon family and friends were moving to the area. 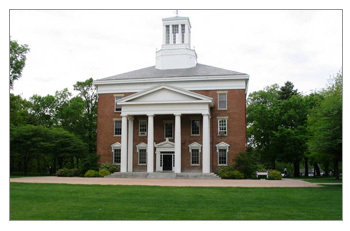 Only eleven years later the cornerstone of Beloit College was laid. Churches and schools were planned, mills were running using the water of the Rock River, and business took root in the village to be named Beloit. Click the following links to be taken to more information regarding Beloit and it's diverse history. Site Content ©2019 Beloit Historical Society. All Rights Reserved.